It’s been a while since I’ve posted a Tuesdays with Dorie assignment! 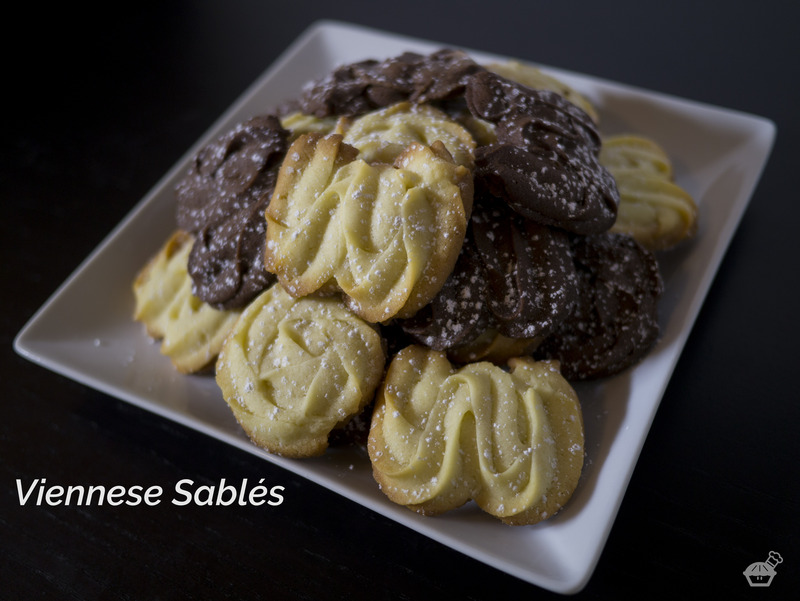 One of the recipes for the month of April is Viennese Sablés. These are crisp and buttery biscuits that are just as easy to make as they are to eat, which makes these very dangerous cookies. I made these Viennese Sablés a few years ago when Baking Chez Moi was first released. I made a note that this recipe did not yield a lot of cookies, so I decided to double make two flavor batches this time around; Dorie provided an alternate chocolate version of the recipe in the Bonne Idée section. The first batch of Viennese Sablés I made were the originals. The aroma of butter and vanilla coming from the oven while these cookies baked was incredible, and seeing the edges slowly turn golden in the oven was very satisfying. Piping the soft cookie dough out into the traditional “W” as well as rosettes were fun. According to Dorie, the “W” can stand for two things: Wittamer or Wien. Wittamer is the name of a pastry shop in Brussels and Wien is “Vienna” in German. The process of making the chocolate version of the Viennese Sablés were similar to making the original, but the ingredients and bake time were modified a little. Unlike the original recipe, I couldn’t test for doneness based on color for the chocolate version. I went off of the bake time that Dorie suggested: 14 minutes rather than 17-20 minutes. I dusted the Viennese Sablés with confectioners sugar, as suggested, but I think I prefer the non-dusted version aesthetically. The confectioners sugar did not add much sweetness to the cookies. As for the taste of these cookies, they are not super-sweet cookies at all! There is a certain elegance about these cookies; both have a nice crispness, the chocolate version has a nice subtlety and the original version has a dangerous buttery-vanilla flavor. Dorie shared another winning recipe with these Viennese Sablés. Viennese Sablés recipe is on page 263 of Baking Chez Moi by Dorie Greenspan. Yours are so pretty – I found this dough extremely hard to pipe though (and also found the yield was not as many as the recipe stated). I’ll make these again and make sure my muscles are warmed up to pipe them out! Thank you, Mardi! The dough was much easier to pipe after the piping bag warmed up in my hands a little. I can’t wait to see yours! What a beautiful bake! Both kinds of cookies are lovely. Thanks for sharing the tips. Can’t wait to make these. Thanks, Shirley! Can’t wait to see yours! Your cookies are so pretty! They would be welcome at any tea party. so happy to have you bake with us again! these are two beautiful versions– i hope mine come out as nicely as yours! Your cookies look very professional. Making a double batch too! I agree with you on the confectioners’ sugar, not needed. We loved these also. Both versions look so pretty. I’m now tempted to try the cocoa flavoured ones. Oh my gosh yours are so beautiful Ryan!! I love the W’s for tradition and your rosettes are simply perfect!! I had a hard time piping at first and realized after the dough warmed a little it was a lot easier. Next time I would wait a bit so the dough was softer! …and welcome back! Your piping is just gorgeous! I love the shapes you made and I’m also impressed that you made both the plain and chocolate versions.